FedEx (NYSE:FDX), long viewed as an economic bellwether, has announced today that profits will likely be better than expected. Up until now, FedEx has been very cautious about prematurely declaring the turnaround in their business is underway, but today’s lift to guidance is a much anticipated sign of confidence. Analysts had pegged the company to earn just 44 cents in their fiscal first quarter which ended in August, but FedEx has raised their own expectation to 58 cents per share. That would still be about 53% lower that lasn year’s profit on a per share basis, but the results are not as dire as originally thought. FedEx also sees fit to lift their view of the second quarter which is just beginning. The Wall St. consensus was for earnings of 70 cents in the quarter, and the new guidance is for earnings of $.65 to $.95 per share. In the company’s press release for the announcement, management states that the improved earnings performance reflects the outlook for fuel prices as well as, “the continued modest recovery in the global economy.” Among other highlights from the quarter was the ever present cost cutting measures, and additionally, international priority shipping was better than expected. However, full details on the quarter won’t be available until Thursday of next week. The upbeat guidance is a great sign though, and the stock is up more than 6% at midday. 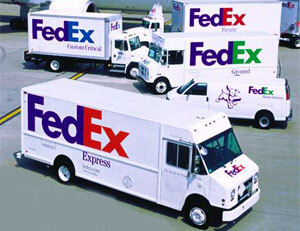 We see this development as a positive for both FedEx and possibly a slightly bullish indicator for the economy. FedEx and UPS (NYSE:UPS) rely so heavily on other businesses making transactions, and the fact that they are starting to see a slight uptick in earnings and at least some categories of shipping volume is a indication that goods are moving. FedEx stock has rallied strongly over the past few weeks, but we are reiterating our Fairly Valued or neutral rating on shares at this point. We think that FedEx may have turned a corner, but they are still dealing with serious declines in earnings and double digit declines in sales from a year ago. At this price, we are not advocating buying because even the improved outlook still looks pretty weak compared to just a year ago.